The late 1970s were a bad time for comics - declining sales and new forms of media were coming into the limelight, and the local comic book shops were suffering. But then Marvel adapted Star Wars and everything changed. This is the story of a comic book industry without hope, saved by guerrilla marketing, a small group of rebels at the first San Diego Comic-Con movie panel — and a bestselling comic book called Star Wars. It was a time when Amazing Spider-Man, Marvel's best-selling title at the time, was only selling 280,000 copies of 590,000 printed. Though a few comic book shops were open at the time, the direct comics market was essentially non-existent, and every comic that didn't sell on the newsstand could be returned for credit. This was a dark time for comics – DC was months away from it's "Implosion", in which the company would cancel thirty-one of its titles abruptly in late 1978. Marvel was a mess throughout the mid-1970's and during my two years as "associate editor," from the beginning of 1976 through the end of 1977. Almost every book was late. There were unscheduled reprints and fill-ins, and we still just plain missed issues here and there. Many books, despite my best efforts to shore up the bottom were unreadable. Not merely bad. Unreadable. Almost all were less than they ought to be. [...] Upstairs, the cheesy non-comics magazine department was losing millions. It seemed like the company as a whole was in a death spiral. After an unsuccessful pitch to Stan Lee, who wanted to concentrate on comics featuring original characters instead of licensed ones, Charlie Lippincott and Ed Summer (owner of the Supersnipe Comic Art Emporium, a comic shop of which George Lucas was a silent partner) pitched Star Wars to Roy Thomas. Thomas was a long-time Marvel writer and former Editor-in-Chief who brought the Conan the Barbarian, another licensed property, to Marvel. Conan was also written by Roy Thomas, and sold nearly as many copies of Amazing Spider-Man at the time, consistently beating Marvel stalwarts like Avengers and Fantastic Four in sales. The Star Wars people didn't ask for any money for the adaptation […] I went with it because it was free. They might have asked for money for the rights when they first approached Marvel and were turned down. By the time they came to me, money wasn't a big factor – they either wanted the book done (on our terms) or they were not going to get the book done. The only stipulation that Lucasfilm put forth regarding publication would be that the first two issues of the adaptation be on newsstands prior to the theatrical release of the movie, in order to drum up publicity for Star Wars. Using camera stills, concept art, and several iterations of the Star Wars script, Roy Thomas and Howard Chaykin crafted the story and visuals that became the Marvel adaptation, printed as Star Wars #1 through #6. The duo did not see a cut of the movie until the first and second issues were at the printers, leading to the inclusion of the scenes that were not in the final cut of the movie, such as the conversation between Biggs Darklighter and the glimpse at the quieter life Luke had on Tatooine with his friends, Fixer and Cammie. I don't think we had any stills from the movie – I think it was just the poster that Howard Chaykin. We had the Star Wars t-shirts we were wearing, and we had copies of the poster, which we were selling for a buck, and we just talked about the movie. We could have shown some McQuarrie production drawings (during the slide show), and I just didn't realize it since I had seen them several times before, but I'm not sure if 20th Century Fox would have wanted those shown to the public. (James) told several people that he should give me his regards, because I had made him rich. He felt that getting Star Wars at that time (was extremely helpful financially). I didn't know Marvel was in such financial problems at the time because I wasn't paying attention to sales after stepping down as Editor-in-Chief two or three years prior. I really wasn't aware of how things had eroded, but there were the little things, like the creeping up in cover price. The book evidently came out and helped Marvel out at a very important time when things were very iffy for them. He willed it (the Star Wars adaptation) to happen. Nobody else wanted to do it. This was before I was Editor-in-Chief; I hope I would've had the sense to listen to him.[...] Star Wars was a tremendous hit and kept the company alive during a very tough time. That book kept the company going. Marvel followed up on the success of Star Wars by giving more newsstand space to licensed properties, yielding extremely successful Battlestar Galactica, G.I. Joe, Indiana Jones, and Transformers ongoing series along with adaptations of Dark Crystal, Labyrinth, and Dune in the 1980s. DC embraced the movement to licensed comics to a lesser extent, due to their significantly lower market share at the time, but DC Comics did produce a variety of licensed comics with Atari. DC Comics' parent company Warner Brothers also benefited from the success of the Superman movie franchise and the Wonder Woman television series, leading DC to move to the forefront in licensing their characters for other forms of media. DC solidified their comic offerings over the past three decades, interestingly enough with the help of Roy Thomas, who would later sign an exclusive contract with DC in the 1980s, leading to Marvel and DC jockeying for the lead position in sales and market share each month in your local comic book store. So, at the end of a six issue adaptation that is now far and away the best-selling comic that Marvel produces, where do you go? You've got to keep printing stories, even though the movie's story has been told. George Lucas had set forth the conditions that Darth Vader could not be used in the comic, nor could the relationship between Luke and Leia could not be explored within the Marvel series, as these were subjects of Alan Dean Foster's masterful novel, Splinter of the Mind's Eye, which was released in 1978 and planned prior as a low-budget sequel should the first Star Wars movie fail at the box office. 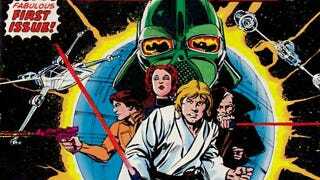 Marvel's Star Wars series ended its nearly ten year run with issue #107, surviving for three years after Return of the Jedi left theaters and providing a life-stream for the series outside of the movies. After a four year absence of the franchise, Marvel was going to publish Star Wars: Dark Empire in 1990, a painted mini-series by Tom Veitch and British artist Cam Kennedy that would continue the story after Return of the Jedi, only to see the publishing rights won by Dark Horse prior to printing and after Marvel had advertised the series (you can see the particularly rare Marvel solicitation above). Dark Empire would kick off Dark Horse's twenty-year plus run with the franchise, with Star Wars arguably keeping another comic book company alive in the process. Images courtesy of Marvel Comics and Lucasfilm. Sources linked within the article, with Starlog #120 and Roy Thomas' Alter Ego #68 also used as reference material.